HP's first-quarter earnings were weak, but expectations are so low that the figures came in above analysts' estimates. It's hard enough being a PC company in a tablet and smartphone world, but Hewlett-Packard isn't doing much to help itself. Sales fell in every HP business unit last quarter -- save one measly 1% gain in its relatively tiny financial services division. HP is trying hard to be about more than just PCs and printers, which are quickly becoming obsolete. But the path to reinvention has been slow. 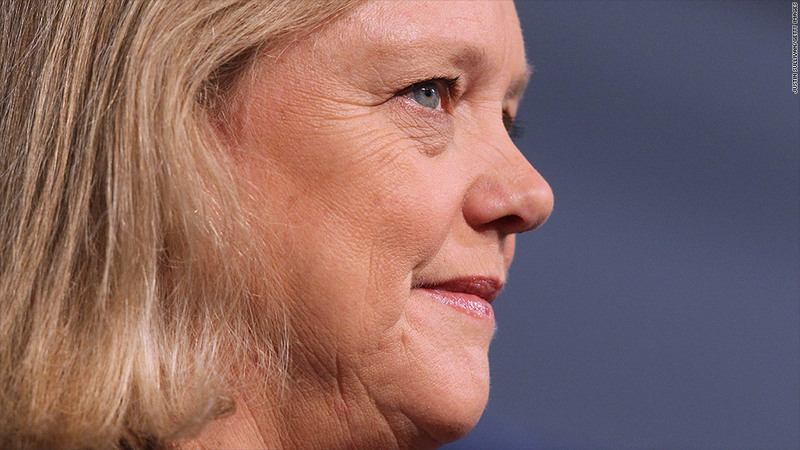 "HP's turnaround will not be linear," CEO Meg Whitman warned on a post-earnings conference call. It's a sentiment she's repeated often. HP hasn't been able to make major inroads in the mobile market, which is dominated by Apple (AAPL) and Android developer Google (GOOG). Revenue in HP's services business fell 7%, its enterprise group declined 4%, and software sales slipped 2% in the company's first quarter, which ended in January. Whitman discussed "tectonic shifts" in the personal device market, citing those issues as a major focus for HP. Meanwhile HP's two legacy businesses continued to suffer: Sales of consumer PCs fell by 13% over the year, and the printing unit fell by 5%. If there's good news, it's is that the company's sales declines weren't as steep as they had been in previous quarters. Wall Street analysts were expecting worse, and shares rose 5.7% in after-hours trading. Overall, HP's (HPQ) first-quarter profit fell 16% over the same period a year ago to $1.2 billion. Sales came in at $28.4 billion, down 6% from a year ago. For 2013, HP expects it will earn between $3.40 and $3.60 per share. That was slightly above estimates from analysts polled by Thomson Reuters, who were expecting outlook of $3.32 a share. Despite HP beating super-low expectations, it's hardly a strong start for 2013, which is shaping up to be another tough year for Meg Whitman. She's held the CEO role for nearly 18 months, and she has continued to preach patience. She has repeatedly said that HP is on a five-year path to recovery. Whitman has faced a lot of setbacks recently. A host of issues plagued the company last year: shockingly low PC sales, big dives in sales and profit, and massive writedowns. In the fourth quarter HP was forced to write down $8.8 billion of the value of Autonomy, the British software company it bought in 2011, after discovering that Autonomy misrepresented its finances.